last saturday was miles' 3rd birthday. to celebrate we drove down to dallas for a trip to the dallas world aquarium. i had never been before, but christy had, and i knew it was a popular destination for wedding receptions, parties, etc. we had a fun time checking out the animals-- but shouldn't it be called a zoo? isn't an aquarium for water life only? after returning home (by the way we of course had lunch at mcdonald's-- the posh one on lemmon near our old stomping grounds at oak lawn) the older boys watched toy story while mom, dad, and baby prepared for an afternoon nap. but before we laid down, miles opened his gifts from wenji and pepaw. there in the box was woody. the prodigal sherrif had returned home! when james was little, woody was his homeboy-- big time. he went nowhere without him. when he was 18 months christy made him a woody costume for halloween-- he wore it out. but one day in a dillard's woody came to an unfortunate end, dropped into a toilet by the child who adored him. as much as we tried to clean him up with lysol and the washer, woody went on permanent hiatus. but, no problem: there were plenty of woody's around, and i bought a second woody. woody2 lasted longer-- so long, in fact, that just like in toy story, the boy became more interested in buzz lightyear with his wings and laser. all woody had was a pullstring. then drenner boy #2 showed up, learned how to walk, and with his older brother's encouragement, dropped woody #2 into the toilet. until last saturday, he was not heard from again. tonight, woody3 lies snuggled with miles. last night at 3:00 miles woke up, crying for woody, and after 10 minutes i found him nudged against the wall between the bed and the floor. this morning miles used woody as a weapon against james and had to go the remainder of the day without him. christy and i must have heard him say, "i want my woody" 50 times today. yesterday woody seemed to vanish fora few minutes and i joked that he's probably in a toilet. christy has banned such comments. sometimes life surprises us. out of the blue we encounter someone we have not thought of in years. a song on the radio reminds us of a random scene long ago forgotten. an experience-- an old movie, seeing a car like you had when you first got your license-- throws you back into the past, into familiarity. and it sort of reminds you of home. somehow woody's return from two wilderness experiences makes things feel a little more complete around here. how long will woody3 last? who knows? 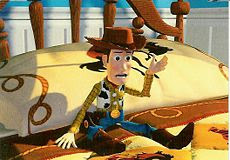 then again, all of this talk may seem like folly to woody. in both toy story movies the line is said, "you are a toy!" at the end of the day, now a second drenner kid gets a little more enjoyment out of life with a toy cowboy. welcome home, woody!